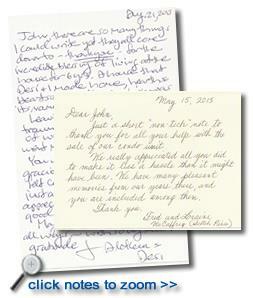 I am pleased to write this letter of recommendation for John as both a friend and a satisfied client. John has successfully helped us with the sale of both commercial property and 2 residential properties. And, with his referral of another qualified agent, we sold another house in Colorado Springs. It has always been a real pleasure working with John over the years. As we all have come to realize, the sale and purchase of real estate is full of many variables and seemingly constant shifts. In such a market; it is invaluable to find honest candor, experiential wisdom and one in whom you can trust. With his many years of experience, John has remained relevant, reliable and realistic in knowing where the market is. Simply put, John is one agent worth having on your side of the signing table. 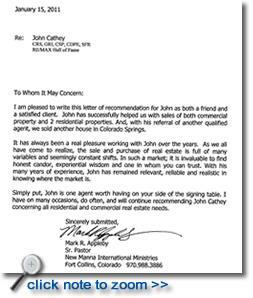 I have on may occasions, do often, and will continue to recommend John Cathey concerning all residential and commercial real estate needs." "John Cathey was extremely helpful and through during our home selling/buying experience. He showed us well over 40 separate houses, some of which we looked at many times. He was diligent with keeping our family's best interests at heart. In addition to his experience and diligence, he was warm and inviting to not only my wife and I, but also our three young children. They looked forward to seeing him when they came along to look at houses with us. I would recommend his services to anyone I know that is in need of a REALTORÂ®." "... Larry and I have been very satisfied with you during the home buying and home selling process. You've been very easy to talk to and very helpful. ... thanks for all you did for us. We appreciate it!" "It was great being with you and I think you picked out just the right property for us. I think it's going to work out one way or another. I just wanted you to know how pleased we were with your service. You probably couldn't tell but we are very particular about who we work with. We have high expectations and feel justified to have them considering the compensation involved. We felt you were one of the best we have ever worked with. Blessings, Carl"
"By the time that John took over the listing on Trilby it was almost in foreclosure and no one was even interested in investing in the property. John took over the listing from one of the discount brokerages, worked extensively with our lender, the bank that held the loan and secured Buyers that were able to invest properly in the home. Unfortunate situation, but we ended up without anything out of pocket." "We really appreciate your time and excellent service." "Just a short 'non-tech' note to thank you for all your help with the sale of our condo unit. We really appreciated all you did to make it less a hassle than it might have been. We have many pleasant memories from our years there, and you are included among them. Thank you." "Raised in Ft. Collins from the age of two, I never thought of coming back after college. A divorce and some thirty-five years later I returned to the town that I had so many fond memories of. After a year of renting, I knew I wanted to stay in Ft. Collins. John was recommended to me through a childhood friend. I had talked to two other agents before I met with him. From the moment we shook hands I knew he was the one who would help me find the house I wanted to buy in the city. He heard my story and what I was looking for in a future in Ft. Collins. After 3 months of searching in earnest, he found me the perfect place to settle. The wonderful thing about John is that he waited until the right place presented itself. There were times when I was ready to give up and buy something that I wouldn't have been happy with. He wouldn't let me do that. Always positive, he helped me to believe, I'd find the home for me. There were times I felt guilty about him showing me another house, when I had turned down so many already. Every time I felt that way he assured me it was just of a matter of time before I found the home of my dreams. In August 2010, my dream came true! The morning my house was listed John called me and said, "I think this is what you've been looking for." He was so right. As soon as I saw it, I put in an offer and the rest is history! I love my home. It was worth the wait. Had it not been for John, I would have settled for something that didn't meet my needs. John was a god send during a difficult moving transition for me. He is the agent that I will send all of my friends and associates to. When and if I sell my house, he will be the one who will list it. After hours of looking at houses, he knows and respects my life story. That is the kind of person I want on my side when buying a home." "We are very grateful for your honest and so cooperative service (for including our entire family)! We could not ask for more. You have well proved your sincere endeavors and we are reaping the benefits."